Marketa McGuire is a hydraulic civil engineer and was recognized as a top 10 finalist for Federal Engineer of the Year by a panel of judges established by the National Society of Professional Engineers. McGuire has completed multiple studies, advancing science in the fields of hydrology, climate and modeling of water resources systems. Engineers like Marketa are the heart of Reclamation. 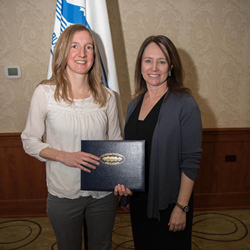 Marketa McGuire, a hydraulic civil engineer, has been named the Bureau of Reclamation's 2018 Engineer of the Year. McGuire was recognized as a top 10 finalist for Federal Engineer of the Year by a panel of judges established by the National Society of Professional Engineers. An awards ceremony was held in Washington, D.C., on February 23, 2018. "Engineers like Marketa are the heart of Reclamation," said Reclamation Commissioner Brenda Burman. "I'd like to extend my congratulations to Marketa for this incredible and well-deserved achievement. Her contributions to Reclamation's mission have enhanced our ability to meet our goals and will enable us to continue responding to long-term water resources needs in the western United States." The majority of technical work completed for the Klamath River Basin Study was performed by McGuire. The knowledge gained from her work on this study equipped her with the tools necessary for a follow-up study to investigate improvements in forecasting streamflow and agricultural demands to enhance daily reservoir operations - a study of which is near its completion. McGuire is completing the Upper Missouri River Impacts Assessment study to build a river systems model designed to characterize historical and future projected river conditions. Additionally, McGuire is working on another project to support the Skokomish Tribe in Washington in their salmon recovery planning efforts. McGuire has completed multiple studies, advancing science in the fields of hydrology, climate and modeling of water resources systems. Her continued efforts to formulate working relationships with other scientists and engineers throughout federal and regional government agencies, universities, and local communities has furthered Reclamation's ability to collaborate across lines. She is also working to leverage existing hydrologic information through partnerships and collaboration with the USGS Alaska Climate Science Center and the University of Washington in an effort to perform a state of the art hydrologic and climate change impacts analysis. Over the years, McGuire has received many awards and honors in appreciation of her work. In May 2015, she received an Award of Appreciation for the completion of the Basin Study Program. She is currently a member of the National Society of Professional Engineers, the American Geophysical Union and the Colorado Water Education Foundation. McGuire is committed to continued learning and spends much of her non-working hours volunteering for programs and projects that help build up communities. Paul Christensen has worked for Reclamation for more than 15 years. Throughout the past three years, Christensen has been the Resident Engineer for the Spanish Fork Provo Reservoir Canal Pipeline Reach 1A and 1B projects, and the Olmsted Hydroelectric Power Plant Replacement Project. He oversees the day-to-day construction management of all associated projects, and effectively manages relationships with contractors and stakeholders. Christensen's construction procedure knowledge and timeliness, his projects have been completed on time and under budget. Currently, Christensen is the Assistant Area Manager responsible for oversight of the Administrative Division, the Field Engineering Division and the Dam Safety modification work being completed in the Provo Area Office. Christensen is very professional and consistent in his duties. He is always striving to get things done right the first time, and has the utmost integrity. Christensen conducts his work admirably, to the benefit of Reclamation and the citizens of Utah. Christopher Davidson is an experienced Commissioning Engineer in the Operations and Maintenance Engineering Group at the Grand Coulee Dam complex. Davidson has evolved his current role into a process, employing an effective blend of repeatable strategies, combined with coaching and mentoring of the teams supporting each commissioning event. Davidson is an active trainer, coach and advocate for the commissioning management sciences, and also integrates safety and situational awareness into all of his work. Davidson has continued contributing to the enhancement of Grand Coulee's operational effectiveness, and has established a structure within which commissioning events result in reusable commissioning resources that work to both simplify and improve timeliness of activities over time. Davidson also supports Engineer Training Program participants by offering guidance and mentorship to further develop participants' general electrical engineering skills while learning about system operations. Hughes has effectively managed a team of Mid-Pacific Construction Office engineers, inspectors and laboratory technicians throughout the execution of several high-profile construction contracts designed to improve Reclamation's infrastructure and refuge water delivery abilities. Most recently, Hughes has served as the Resident Engineer for the Safety of Dam Modification at Stampede Dam. His leadership and foresight for issue recognition and resolution has resulted in a number of instances where Reclamation was able to proactively correct potential issues without impacting facility operations. Hughes has been instrumental in building effective relationships with cooperating offices and agencies to effectively mitigate concerns, and to ultimately protect public safety. Many of the practices Hughes implemented on the Stampede Dam project have become general practice for the construction office. Throughout his time working for Reclamation, Hughes' leadership has generated a high level of trust among his team. In addition, Hughes has become an effective training instructor for project managers throughout the region. Allison Danner served as the project manager for the Reclamation Water Information System and Reclamation Information Sharing Environment projects, designed to achieve new levels of data accessibility. She served as the lead civil engineer for the San Diego Basin Study which sought to obtain answers to resource availability questions, representing a significant effort to pursue Reclamation's mission of delivering water to the western United States. Danner's hard work and exceptional leadership skills played an integral role in successfully launching these projects by providing necessary and effective coordination with team members throughout Reclamation. Kurt Anderson played a vital role in managing the design effort for a recreation site on Canyon Ferry Reservoir in Montana in 2014. He effectively kept the project on track which led to the assurance of the project's award that fiscal year. Today, that site is an attractive recreation facility, and is a popular destination for campers, boaters and anglers. In 2015, Anderson was promoted to Regional Construction Engineer where he is responsible for all construction activities occurring in the Great Plains region. He manages construction administration for dozens of water resource rehabilitation projects each year, including Safety of Dams projects and powerplant rehabilitations. Anderson manages to accomplish this with a small staff of 20 employees, and does this by utilizing creative innovations to approach issues with heightened efficiency.